'WHO AM I?' 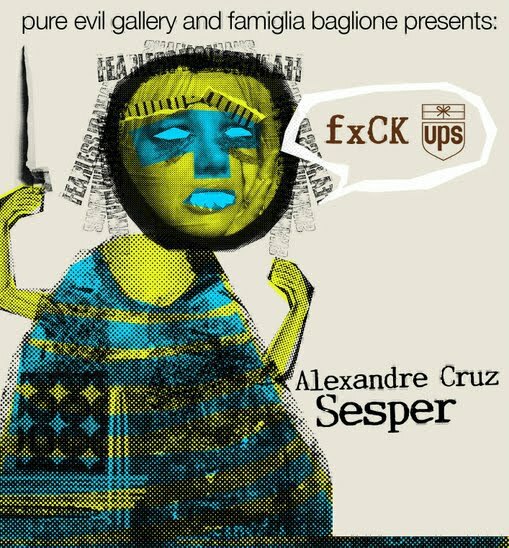 is the title of the UK solo show of Brazilian artist Alexandre 'Sesper' Cruz at the Pure Evil Gallery. The exhibition was due to open last week at the space, but after UPS failed to deliver the work on time if was postponed last minute. With the work having finally arrived in London the show is opening tonight with a private view from 6pm. Sesper is best known for his unique mixed media artwork. He uses recycled material such as paper, cardboard and wood as his surface and paints over these with oil pastel and latex, incorporating layer upon layer of texture and color. A member of the renowned Brazilian art collective, the Famiglia Baglione, Sesper has participated in and filmed many of their live painting and gallery installations around Brazil. The exhibition opens this evening, 24 February from 6pm and will run at the gallery until the 6 March 2011.